Keep cozy with a neck warmer that can quickly convert into a hat with just a pull of a drawstring. The intricate scalloped design looks beautiful either way you wear it. It’s made with ultra-soft yarn that is hand crocheted by skilled fiber artists in Lima, Peru, who are paid fair wages. Dimensions: 7" diameter x 8" x 2"
Sent this to my friend in the frigid north and she loves it. Beautiful color and very soft i love the shell pattern. I bought two so I can wear one was a scarf and the other as a hat. The cozy neck warmer-hat hybrid from Peruvian Trading Company showcases the careful craftsmanship of talented fiber artists in Peru who make each one. The network of knitters and crocheters in and around Lima are paid fair wages, which demonstrates the commitment of co-founders Javier and Patricia Dam to the people of their native country. The couple have been helping support their fellow Peruvians for over twenty years. 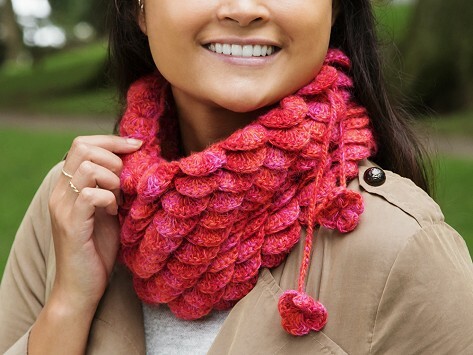 The beautiful scalloped design of the neck warmers is intricately crocheted. Look on the inside to see the network of stitches that provides the plush foundation. It’s an ultra-soft accessory you’ll be happy to reach for when temperatures start to drop. Forgot your hat? The warmer transforms into one with just one pull on the drawstring.